A mob torched a church where hundreds had sought refuge Tuesday, and witnesses said dozens of people - including children - were burned alive or hacked to death with machetes in ethnic violence that followed Kenya's disputed election. The killing of up to 50 ethnic Kikuyus in the Rift Valley city of Eldoret brought the death toll from four days of rioting to more than 275, raising fears of further unrest in what has been one of Africa's most stable democracies. The latest violence recalled scenes from the genocide in Rwanda in 1994, when more than a half-million people were killed. The question facing Kenya is whether the politicians will lose control of the mobs, triggering a civil war. President Mwai Kibaki, who was swiftly inaugurated for a second term Sunday after a vote that critics said was rigged, called for a meeting with his political opponents - a significant softening of tone for a man who rarely speaks to the press and who vowed to crack down on rioters. But opposition candidate Raila Odinga refused, saying he would meet Kibaki only "if he announces that he was not elected." Odinga accused the government of stoking the chaos, telling The Associated Press in an interview that Kibaki's administration "is guilty, directly, of genocide." The violence - from the shantytowns of Nairobi to resort towns on the sweltering coast - has exposed long-festering tribal resentment. 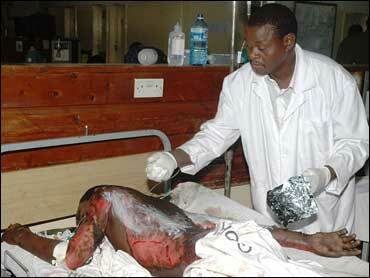 The people killed in Eldoret, about 185 miles northwest of Nairobi, were members of Kibaki's Kikuyu tribe. On Tuesday morning, a mob of about 2,000 arrived at the church, said George Karanja, whose family had sought refuge there. "They started burning the church," Karanja told the AP in a telephone interview, his voice catching with emotion as he described the scene. "The mattresses that people were sleeping on caught fire. There was a stampede, and people fell on one another." Karanja, 37, helped pull out at least 10 people, but added, "I could not manage to pull out my sister's son. He was screaming 'Uncle, uncle!' ... He died." The boy was 11. Up to 50 people were killed in the attack, said a Red Cross official who spoke on condition of anonymity because her name would identify her tribe, and she feared reprisal. Even first aid workers were stopped by vigilantes who demanded their identity. Numerous blockades along the road to Eldoret increased the dangers of traveling. Karanja said his two children raised their hands as they left the church and they were beaten with a cane, but not killed. His 90-year-old father was attacked with a machete, but survived, he said. "The worst part is that they were hacking people and then setting them on fire," he added. The attackers saw Karanja saving people and began stoning him, he said. Karanja said he ran and hid - submerging himself in a pit latrine outside the church property. He stayed there about 30 minutes until he heard people speaking Kikuyu, he added. The Kikuyu, Kenya's largest ethnic group, are accused of turning their dominance of politics and business to the detriment of others. Odinga is from the Luo tribe, a smaller but still major tribe that says it has been marginalized. There are more than 40 tribes in Kenya, and political leaders have often used unemployed and uneducated young men to intimidate opponents. While Kibaki and Odinga have support from across the tribal spectrum, the youth responsible for the violence tend to see politics in strictly ethnic terms. In Nairobi's slums, which are often divided along tribal lines, rival groups have been fighting each other with machetes and sticks as police use tear gas and bullets to keep them from pouring into the city center. The capital has been a ghost town for days, with residents stocking up on food and water and staying in their homes. Parents in the capital's slums - home to a third of its population - searched for food, with many shops closed because of looting. Anne Njoki, a 28-year-old Kikuyu, said she fled her home in a shantytown after she saw Kikuyus being attacked and their homes looted. She was camped near a military base with her sister, 3-year-old nephew and 7-year-old niece. "They have taken our beds, blankets, even spoons," she said of the looters. In the Mathare slum, Odinga supporters torched a minibus and attacked Kikuyu travelers, witnesses said. "The car had 14 people in it, but they only slashed Kikuyus," said witness Boniface Mwangi. Five were attacked by the machete-wielding gang, he said. The prospect of even more violence is ahead. Odinga has accused the president of genocide and called for a mass protest on Thursday, which will rally hundreds of thousands of his angry supporters, reports CBS News correspondent Elizabeth Palmer. The government banned the demonstration, but Odinga said: "It doesn't matter what they say." The widespread violence and gathering international pressure could lead Kibaki to seek a compromise with the opposition. The European Union and the United States have refused to congratulate Kibaki, and the EU and four top Kenyan election officials have called for an independent inquiry. In Britain, Kenya's former colonial ruler, Prime Minister Gordon Brown urged Kibaki and Odinga to hold talks. Election commission chairman Samuel Kivuitu said Tuesday he had been pressed by both an opposition party and Kibaki's Party of National Unity to release the results of the vote. Western ambassadors "wanted me to delay announcing the results, even if it is for a week," to allow the commission to investigate alleged irregularities, he said. Kenya's tourism industry, which brings in some $900 million and attracts more than 1 million visitors a year, is sure to suffer from the violence. The United States has warned tourists against all but essential travel to Kenya, and Britain has advised against travel in some areas. Stuart Dickson, a Canadian who was vacationing in Nairobi, said he was cutting short his visit. "We are leaving early because of the riots and how dangerous it is to be out on the streets," he said. "With shops being closed and everything, it is not the best place for a tourist or traveler to be right now."